The Winter Sale is now on! You can save up to £34 on your subscription - order now with code WINTER19. 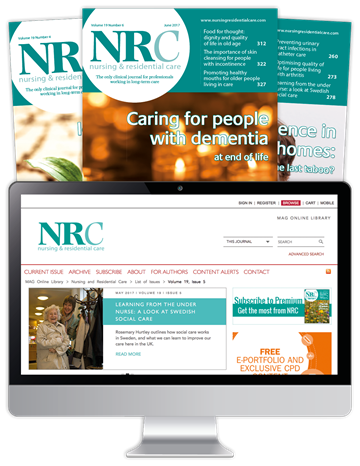 Nursing & Residential Care (NRC) is the peer-reviewed, professional journal dedicated to the successful management of care homes. It publishes the information that managers need to maximise the efficiency and effectiveness of service provision, and the information staff need to deliver therapeutic, person-centred care. Save 15% on your subscription until 15th February. To claim this offer, simply select your preferred subscription option below, and quote code WINTER19 when prompted. Your discount will be added at the checkout. Annual or quarterly subscriptions only.